Smart Programmable Thermostats: Is Bigger Better? There are a wide variety of programmable thermostats available on the market today. Some purport to save property owners as much as 30 percent on their cooling bills. 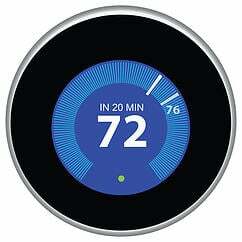 So-called "smart" thermostats certainly make managing heating and cooling easier for people. But, how do homeowners find the right programmable thermostats for their homes? Smart thermostats cost more than regular programmable thermostats. But, the increase in efficiency may be worth it. At A. Borrelli Residential & Commercial HVAC Services, we sell and install the most efficient programmable thermostats to meet our clients’ needs. Most HVAC experts argue that the best programmable thermostats require the least input from property owners and users. The justification for this lies in the relationship between the thermostat and the HVAC equipment. Programmable thermostats are designed to keep rooms at an ideal temperature for the people occupying the room at that particular moment. As such, programmable thermostats such as Google’s Nest, Ecobee’s Ecobee3 and Honeywell’s Lyric are built to identify the best times to turn on the heating or cooling. Ecobee3 and Lyric sense when people have left the building, and adjust the temperature accordingly. Nest relies on users’ adjustment of the thermostat in the first few days to create settings that reflect the residents’ actual preferences. The convenience of having a thermostat that can adjust your settings without your input is clear. Most programmable thermostats require that you create individual settings to reflect your general needs from day to day. Commercial operations may find this easier to establish, given a regular workday routine. This effort by the manufacturers to make the thermostats more convenient extends to a number of other features, as well. While the thermostats themselves are designed to be simple to use, they connect into a wide communication system. Users may then view or change settings, and see energy consumption and efficiency by computer, tablet or smart phone. This convenience comes at a cost, however. While programmable thermostats start at around $60 for the lower-end models, smart thermostats may come with a price tag of $250 or more. Taking users largely out of the equation often results in greater efficiency. The United States Department of Energy claims that a programmable thermostat may save as much as 30 percent on energy bills. However, that efficiency decreases when users are expected to create efficient settings. As such, the less time homeowners spend adjusting their programmable thermostats, the greater their efficiency. The technicians at A. Borrelli HVAC can help you decide if the extra cost for a smart programmable thermostat will save you money over the life of the thermostat. There is no one right choice when it comes to programmable thermostats. Property owners must weigh the additional cost of smart thermostats compared to improved convenience and efficiency. If you are considering upgrading your thermostat to a programmable or smart thermostat system, call A. Borrelli Mechanical for expert advice and professional service in the New York City Metro area and Westchester County.